The Budget Session of Delhi Legislative Assembly got off to an uproarious start today with the Opposition disrupting the Lieutenant-Governor’s address and demanding that he dismiss the allegedly corrupt Sheila Dikshit Ministry. BJP MLAs protesting against the Congress-led government even as the Lt-Governor, Mr B. L. Joshi, continues to read out the Budget speech in the Capital on Tuesday. The ADM of North-West is conducting an inquiry into a case of alleged suicide by a 30-year-old man in the Shanti Nagar police station of North-West district last night. Over five years after a man was caught with one kg smack in Pitampura area of the Capital, a Delhi court today sentenced him to rigorous imprisonment of ten years and imposed a fine of Rs 1 lakh. Taking note of a dispute over supply of electricity to lakhs of slum dwellers, the Supreme Court has issued notice to the Delhi Government seeking its reply why the matter relating to the distribution in slum colonies should not be sent to arbitration. It was a harrowing experience that was repeated this year as students scheduled to appear for board exams were delayed owing to traffic restrictions because of VIP movement. A similar incident in the past had led to protests when road blockades for former Home Minister L. K. Advani’s visit to the CISF’s Raising Day function caused several students to miss their Board examinations. Two unidentified youths, armed with rods and sticks, attacked and ransacked the office of a correspondent of the Hindi daily ‘Punjab Kesri’ here last night. The incident took place around 11pm, when the office was closed. Cutting across party lines members of the Municipal Corporation of Delhi today unanimously demanded inquiry against the Chief Secretary, who had allegedly tried to misguide the Lt- Governor by saying that the Municipal Commissioner had given his consent to privatise the maintenance work of streetlights in the areas covered by the civic body. The ‘Perfect Vision Eye Clinic’, is participating in the Surajkund Trade Fest at Trade Fair Ground, Sector-12, Faridabad. 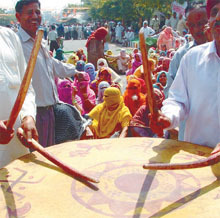 The exhibition is organised under the banner of Trade Fair Authority of Haryana. The UP Chief Minster and Samajwadi Party Supremo, Mr Mulayam Singh Yadav, has rejected the demand for carving out a Harit Pradesh from UP, saying that small states are not good for the security and development of the country. A youth had to pay a very heavy price for watching the fight between two bulls near a vegetable market in Khora. He was killed as the animals charged against him suddenly. Over 10,000 runners, including women, schoolchildren, senior citizens and physically challenged kids, are expected to participate in Noida’s first-ever ‘Half Marathon’ on April 10. The city is celebrating its foundation week from April 10 to April 17. Pray, who is the DC here? There seems to be an utter confusion in the Haryana Government staff, especially the officials organising the ‘Trade Fair’ here, as to who is the Deputy Commissioner of the district at present. This was visible at the cultural programme organised by the authorities last evening on the fair premises. The wife of a man along with his younger brother strangled him in Ram Park Extension Colony, Loni, as the deceased had become a hindrance in the illicit relations between the woman and her bother-in-law. The lawyers of the Delhi High Court, three District Courts and the Debt Recovery Tribunal today went on strike to protest against setting up of four permanent Lok Adalats. The UP Chief Minister, Mr Mulayam Singh Yadav, had made up his mind to fire Greater Noida police officials for the Kasna police faux pas in which the state Urban Development Minister had allegedly been mistreated in Ghaziabad on Sunday. Pay Rs 5,000 for copying in exams! The students of Jhajhar area were allegedly promised the right to copy in the exam centres in Aligarh if they pay Rs 5,000. As soon as Lieutenant-Governor B. L. Joshi took the podium to deliver his customary address on the first day of the Assembly session, BJP legislators started shouting slogans condemning the Sheila Dikshit Ministry for alleged involvement in corruption and demanding its dismissal. 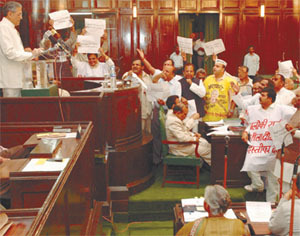 The BJP MLAs displayed banners and placards and some MLAs even wore vests on which anti-corruption slogans were written. After a few minutes, they came to the Well of the House and continued raising slogans directly in front of the Lieutenant-Governor’s podium. Though Joshi continued speaking, his voice was completely drowned by the sloganeering, which did not stop for the entire half-hour that he spoke. Leader of Opposition Jagdish Mukhi asked Mr Joshi to “listen to your conscience and dismiss the Sheila Dikshit Government, which is steeped in corruption”. In the past few months, a series of corruption scams have rocked the government. The latest is an expose by a television news channel of over 80 employees of the sales tax department accepting bribe, Mukhi alleged. Chief Minister Dikshit later told reporters she had asked the Opposition to maintain decorum during the Lieutenant-Governor’s address; “however, they chose to disrupt the speech, which was unfortunate”. Meanwhile, the Assembly was adjourned for the day after paying tribute to former Prime Minister P. V. Narasimha Rao and those killed in the tsunami tragedy of December 26 last year. Ms Dikshit said the government, MLAs and people of Delhi had contributed Rs 11 crore for the relief of tsunami-affected people. The ADM of North-West is conducting an inquiry into a case of alleged suicide by a 30-year-old man in the Shanti Nagar police station of North-West district last night. The deceased has been identified as Parmeshwar Dayal, resident of Karawal Nagar, who was running a business in artificial jewellery at Ganesh Pura, Tri Nagar. The police said that Ms Dulari (60), reported to the police on March 4 that her son was abducted and the police during investigations traced Dayal in Bhorgaon, a village 70 kilometers away from Pune. Immediately, a police team was rushed to the area and Dayal was brought back to Delhi last night in Jhelum Express. After bringing Dayal back to Delhi, the police informed his family members about his rescue and asked them to take him home. When there was no response from his family members, Dayal was allowed to stay back in the police station last night. Incidentally, this morning the police found that Dayal was lying unconscious in the toilet and he was reported brought dead in the Sunder Lal Jain Hospital. During preliminary investigations at the police station, the police said that Dayal had committed suicide by touching a live wire after breaking the bulb holder. However, the police also transferred Sub-Inspector Randhir Singh, in-charge of Shanti Nagar police post and constable Ravi Dutt to District Lines on the charges of negligence. A 42-year-old woman committed suicide this morning by jumping off from the fourth floor of her flat in the Railway quarters in Panchkuian Road. The police said that the deceased has been identified as Anju Gupta and her husband as Anand Dev Gupta (45). The couple had been married for about 20-years and have two daughters. The police said that a call was received this morning at around 7 a.m. that Anju was found dead. However, the police said that there was no suicide note recovered from the spot. A case of suicide has been registered and the police are trying to ascertain the cause of her death. The Additional Sessions Judge Chandra Shekhar pronounced the sentence after holding Raseed Mohammad, a resident of Jhalawa district in Rajasthan, guilty under the Narcotic Drugs and Psychotrophic Substances Act. Raseed was arrested on March 1, 2000, while he was carrying the drug in a polythene bag. The prosecution examined ten witnesses in the case. A city court has today summoned an MCD head clerk who was caught accepting bribe last year. The court took cognizance of the chargesheet filed against him by the CBI. Special CBI Judge Pratibha Rani summoned Karambir Singh Yadav, then posted in the MCD Zonal office at Rohini, for facing allegations in the chargesheet filed almost one year after the incident on February 25, 2004. The delay occurred because the government granted the mandatory sanction for prosecuting public servants only on February 3, 2005. The CBI, thereafter, filed the chargesheet on February 23. A Bench comprising Chief Justice R. C. Lahoti, Mr Justice D. M. Dharmadhikari and Mr Justice A. R. Lakshmanan issued the notice on the petition by an association of power distributors, assigned the job of providing “single point” connection in 238 slum localities and collecting the electricity bills, prior to the privatisation of distribution. The petition filed by the association had sought a direction to the government to continue with its service in distribution of power in the unauthorised slum localities. With the distribution of power handed over to private companies, New Delhi Power Ltd (NDPL), BSES Yamuna Power Ltd, BSES Rajdhani Power Ltd and Delhi Transco Ltd, the government had terminated the services of association. The association said that the erstwhile Delhi Vidyut Board had entered into an agreement with around 550 single-point agency holders for distribution of power and the “arbitrary” termination of their services was illegal. The petitioner said that with the privatisation of power distribution and termination of the services of the agency holders, nearly 15,000 workers engaged by such agencies, had been rendered jobless. This year too traffic controls for the Prime Minister’s convoy to the same event this year left schoolchildren stranded on their way to exam centres. 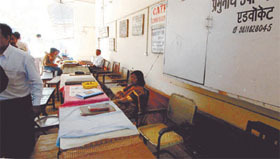 Many students complained of reaching late because of the severe congestion in many areas of the Capital. While in Ghaziabad, the road from Ghazipur to NH 24 and from Ghazipur to Mother Dairy in Patparganj had been blocked completely, several roads from Laxmi Nagar to Mother Dairy and Vikas Marg to ITO in Delhi were congested because of barricading. Even the Outer Mudrika buses, which run every two minutes on the route, had been put on hold between 8.30 am and 11.00 am causing inconvenience to daily commuters, especially children on their way to school. While students were the worse sufferers, the traffic officials, while conceding that problems did occur, refused to accept that children appearing for their examinations had suffered because of the blockade. However, the Controller, Board Examination, Mr. Pavnesh Kumar, said that the Board has not received any complaint from schools or students about the delay. The assailants broke down the glass doors and windows of the office located on the Neelam-Bata Road here. The police have registered a case under Sections 427 and 506 of the IPC. No arrest has been made so far. According to the complainant, Mr Subhash Sharma, a reporter of the ‘Punjab Kesri’ here, the assailants, who damaged his office in his absence, wanted to create create a panic and prevent him from writing about certain illegal activities in and around the town. Mr Sharma suspects that some persons involved in the illegal construction of buildings and multi-storeys in the Surajkund area could be behind this attack. He had filed an application with the Supreme Court about the illegal construction two months ago. Mr Sharma had also filed a PIL before the High Court alleging illegal mining in the area, a few years ago. A case had been pending with the CBI in this connection, in which the accused, included a former minister of Haryana, several political and non-political organisations and leaders have condemned the incident and demanded immediate arrest of the culprits and the persons behind it. Some of the local BJP and the INLD leaders visited the spot and demanded a detailed probe into it. Describing the incident as an attack on the freedom of the press and media, some of the local journalists sought immediate action against the accused. It may be recalled that Mr Sharma had already been provided a security guard by the state police in connection with a case pending with the CBI. Cutting across party lines members of the Municipal Corporation of Delhi (MCD) today unanimously demanded inquiry against the Chief Secretary, who had allegedly tried to misguide the Lt- Governor by saying that the Municipal Commissioner had given his consent to privatise the maintenance work of streetlights in the areas covered by the civic body. The councillors demanded that an inquiry should be ordered and strict action should be taken against the officer concerned. The issue was raised by the BJP Councillor, Mr Vijender Gupta, in the House when it met today. He alleged that the Municipal Commissioner, Mr Rakesh Mehta, had given his consent to the Delhi Government to move towards the privatisation of the maintenance work of streetlights in the Capital. However, the Municipal Commissioner has refused agreeing to any such proposals. Mr Gupta alleged that the Cabinet meeting in which the privatisation of the maintenance work of streetlights was discussed was attended by senior officers of the Delhi Government as well as the Municipal Commissioner. Mr Gupta said that the MCD Commissioner was not empowered to take such decisions. It is the MCD House that is authorised to take such a decision. He said that DISCOMS collected Rs 7000 crore as electricity bills every year in which the Corporation has a share of five per cent. Instead of giving its share, the issue of privatisation of the maintenance of streetlights is being discussed, he said. The main objective of the clinic is to educate the masses about the latest technology in the field of eye care. According to Mr Ankit Aggarwal, Managing Director, ‘Perfect Vision Eye Clinic’, the hospital has most of the state-of-the-art technology related to eye care. This strong dose was administered to Chaudhry Ajit Singh, the crusader for a Harit Pradesh for a long time. The Chief Minster, who was speaking at the silver jubilee celebrations of Chaudhry Charan Singh ITI at Patla Niwadi village in Modinagar on Sunday, had shared the dais with Ajit Singh, the Rashtriya Lok Dal supremo. Earlier, Ajit Singh in his speech reiterated the need for creating a Harit Pradesh in the interest of the western UP, especially of the farming community. But Mulayam Singh Yadav, in his 30-minute speech, showed his displeasure at the police officers serving in western UP and told them to mend their ways, or otherwise be prepared to face the music. It is surprising that the police in western UP are not taking any cue from the action being taken by the government against the criminals in Lucknow, the Chief Minister said. The Chief Minister had not wavered for a minute in sending his own party MP Ateek Ahmed and his brother to jail after an FIR had been registered against the duo, he said. Mr Yadav told the police administration to arrest and take strong action against the land mafia, criminals, and all those, including officials, who are involved in crimes against the people and the state. The state government wants to improve the standards of the workers and farmers’ section, for whom, 72% of budget allocation has been earmarked this year. Mr Yadav also announced grants for Patla Hospital and Gayatri Vidya Peeth School, respectively, on the occasion. While everyone ran for safety during their fight, Swaminath Prasad kept standing on the roadside with his brother Shankar and watched the fight. He was badly injured when one of the bulls lifted him with his horns and trampled him. Swaminath Prasad was rushed to government hospital in Sector-30, Noida, where he succumbed to his injuries. It may be recalled that a mad bull had killed two persons in Preet Vihar a few days ago. As a matter of fact, such attacks by the stray bulls have terrorised the people of NCR. The Chairman of the UP Development Council, Mr Amar Singh, MP, will be the chief patron. The Noida Chairman, Mr Deo Dutt, said that the marathon, being held under the aegis of Noida Sports Trust, will attract more than 10,000 runners from all over India. The Noida Authority is supporting the event. With Rs 10 lakh up for grabs as prize money, the event will attract the nation’s leading runners. A prize money of Rs 2 lakh will be distributed to the children and physically challenged participants. The 3-km ‘Celebrity Run’ will commence at 8.30 a.m. Registrations for the Noida ‘Half Marathon 2005’ will begin on March 12 and close on March 31. The entry fee for Indian participants will be Rs 50 for the ‘Half Marathon’ and Rs 100 for the ‘Celebrity Run’. This is the first time that physically challenged children will be participating in a marathon run, the Chairman said. Mr Dutt said that the Chief Minister, Mr Mulayam Singh Yadav and Mr Amar Singh were keen that Noida should be developed and projected as a sports city. “We are developing the necessary sports infrastructure of international standard and are sure that Noida will be the venue for few of the events during the 2010 Commonwealth Games,” the Chairman said. The Sahara TV will telecast the event live. Those interested in participating in the event can call on 0120-2531421 or log on to www.noidamarathon.com to download the entry form. An employee of the state government made announcement at the stage about the event, and later, one organising official announced that Mr M. R. Anand, Deputy Commissioner, had arrived there as chief guest. But earlier, a senior district official told this correspondent that the new Deputy Commissioner, Ms Neerja Shekhar, had taken over the charge of the office of the DC relieving her predecessor on Monday. It was also reported that the new DC had taken a round of the ongoing ‘Tradefest’ the same day. But on the other hand, organisers of the evening programmes of the ‘Tradefest’ kept telling the audience that Mr Anand (outgoing) is the chief guest of the evening. Even a senior official of the Industries Department presented a bouquet to Mr Anand and his wife. The programme anchor, too, kept announcing that Mr Anand is the DC. It may be recalled that the Haryana Government has posted new Deputy Commissioners in 18 districts of the state. The Public Relations department, however, is still to issue an official press release about the joining of the new DC here. Meanwhile, nearly all the senior officials, including the IAS and the HCS, are keenly awaiting their transfer orders, as it is expected that these transfers could be announced anytime by the new government. Faridabad is considered to be one of the most favoured places of posting for the officials close to corridors of power. After strangulating the man, the lovers sprinkled kerosene and set the house on fire before fleeing. As the smoke started coming out of the house, the neighbours informed the police. The culprits were caught in due course. The half-burnt body has been sent for a postmortem. Rajesh Kumar, alias Pappu, son of Sheshpal Singh, lived in Ram Park Extension Colony with wife Usha, daughter Rupali and son Pankaj. About two months ago, his younger brother Bhola had come and started staying with him. Two brothers often clashed. According to daughter Rupali, her mother Usha had held her father’s feet lightly while uncle Bhola had strangled her father with a ‘dupatta’ on March 13. As they were committing the crime, their children peeped through, Usha then scolded them and told them to go to sleep. In the morning, the children were dropped in their school and the lovelorn couple then fled, but were caught later. The lawyers decided to go on strike after the Delhi Government recently decided to open four Lok Adalats for hearing cases related to the public utility services. The Bar Associations said that the lawyers wanted to abolish certain sections of the Legal Services Authorities Act that makes the verdict of the Lok Adalats final. The UP Chief Minister, Mr Mulayam Singh Yadav, had made up his mind to fire Greater Noida police officials for the Kasna police faux pas in which the state Urban Development Minister had allegedly been mistreated in Ghaziabad on Sunday. However, this was not to be. The Ghaziabad police instead came in the Chief Minister’s firing range. It is learnt that Mulayam Singh Yadav had come prepared to suspend senior Noida police officers for the Kasna goof. The basis for this action was said to be a report of Addl. D-G police (law and order) Bua Singh who had submitted a report to the government after visiting the Kasna police station last week. The families of three missing junk dealers of Dadri, believed to have been killed by the Kasna police, had also gone to meet the Chief Minister in Ghaziabad on Sunday. The Chief Minister was also aware of this development. According to informed circle, the Chief Minister had already made up his mind to take a tough stance on the basis of the feedback of senior officers. But that was not to be due to the outburst of UP Urban Development Minister Mohd Azam Khan. The students of Jhajhar area were allegedly promised the right to copy in the exam centres in Aligarh if they pay Rs 5,000. Exam mafias are reportedly active in the area and they charge Rs 5,000 from the students who failed for filling admission forms in some known schools and colleges with a promise that they would be allowed to copy. According to sources, in some of these institutions, the answers to question papers are written on blackboards in the examination halls to enable the examinees to copy easily. However, this time, when a group of students contacted the exam contractors, three days before the exams, they were asked for another Rs 3,000 for admission cards. A large number of students from Meerut, Barot, Bagpat, Bulandshahar, Ghaziabad, and some even from Rajasthan, had to return dejected as they could not shell out additional Rs 3,000 for the examination admission cards.